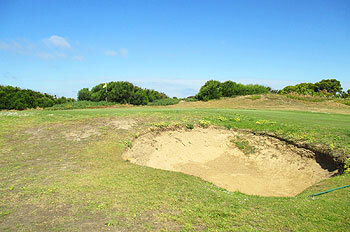 The Portuguese can thank the British for introducing the game of golf to Portugal in the 19th century when a group of British wine exporters formed Oporto Niblicks Club at Espinho in 1890 laying out a rudimentary nine-hole course on a strip of sandy linksland to the south of Oporto. The eldest club in Portugal – and the fifth oldest in Continental Europe after Pau (1856), Dinard (1887), Biarritz and Royal Antwerp (both 1888) – was renamed Oporto Golf Club in 1901 and it remained an exclusive British preserve for the next three decades. Remodelled by Philip Mackenzie Ross in the late 1950s, Oporto Golf Club is a traditional affair and the clubhouse is a monument to the history of Portuguese golf but the course itself is rather special too. Oporto is routed across the most authentic links ground in Iberia and the whole experience is a rather surreal British links-like affair except, of course, the sun shines more frequently here in northern Portugal. With few weaknesses and some pleasant, subtle undulations, the relatively short Oporto is one of Portugal’s unsung courses and should be included on any serious golf aficionado’s Portuguese itinerary. A very interesting traditional course that is a cross between links and parkland. It has a good mix of holes laid on out quite a flat piece of land. There is a little water comes into play on the closing holes but it is natural and not intrusive. The opening short par four holes are a warm up for some strong holes such as 4th, 7th 13th and 15th. The par threes are a nice mix of length and direction. The greens were excellent with fast true putting surfaces and the fairways good but large areas of rough were a bit patchy and short of grass. The clubhouse is a wonderful old building just full of tradition and history befitting such an old Club. The current national ranking of this course might indicate that Oporto isn’t one of the top tracks in Portugal but don’t let that put you off playing this little beauty as it’s a wonderful old historic venue that lacks absolutely nothing in the charm stakes. 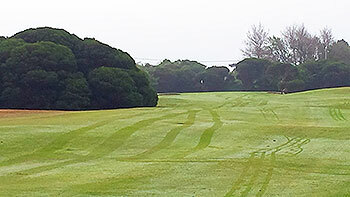 In fairness, the opening and closing holes on each nine are a little removed from the coast and are therefore more parkland in nature but the remainder of the course is played out on the other side of a road that runs along the seashore and these fairways are as links like as you’ll get in this part of the world. Greens – many of them 2-tiered – are positively tiny so approach play accuracy is the name of the game on a course that barely reaches 6,000 yards off the back tees. I particularly liked the run of holes from 5 to 8, the last of which is a wonderful par three (pictured) playing into the Atlantic breeze to a shallow raised green that tilts from left to right, protected at the front by an intimidating deep bunker – you’ll be hard pressed to play a better short hole than this anywhere north of the Algarve. The clubhouse was relocated in the 1980s from the other side of the railway line that runs alongside the property – meaning golfers no longer have to play the opening shot of their round across the tracks! – and its crammed with old artefacts and memorabilia that link the club right back to the Skeffington Cup, which members first contested in 1891, the year after Oporto was formed. This is a real old-fashioned, down to earth member club where local golfers are well aware of its history and more than happy to help you feel as proud of their golfing heritage as they are.